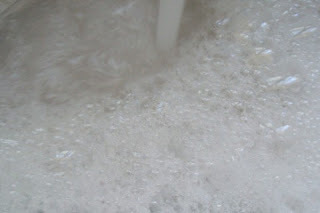 This is the amount of suds I am getting just from rinsing the bowl I used in running water! The result of the 20 minute DIY Project! 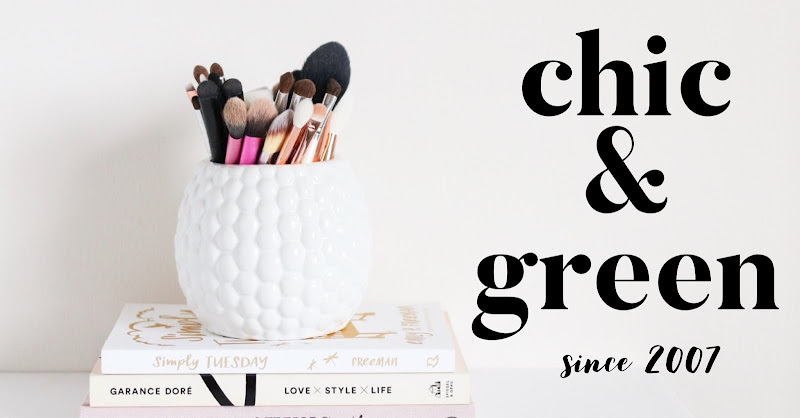 Today for DIY Wednesday we're going to use 1 base to make two different products. 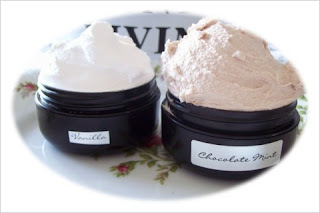 This is a very simple project and you will be able to make 2 products--Foaming Bath Whip (cream soap) and a Foaming Sugar Scrub--in about 20 minutes start to finish! Let's talk about our supplies. 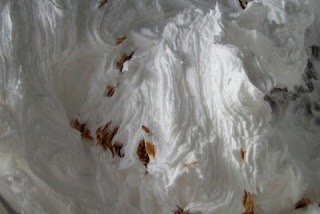 I am using CRAFTER'S CHOICE FOAMING BATH WHIP BASE from Wholesale Supplies Plus. I have a one gallon bucket. This will cost around $30, but will make many large jars for you to make as gifts or just for some at-home pampering! You'll also need some carrier oil. I like GRAPESEED OIL because it is a very non greasy oil. SWEET ALMOND OIL is also great in this. Buy these at your favorite natural foods store or even at some supermarkets. Wegmans has both oils. I am also using VANILLA ESSENTIAL OIL, COCOA ABSOLUTE, and PEPPERMINT ESSENTIAL OIL for the scenting of these items. 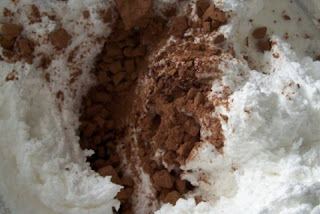 A good organic cocoa powder and plain white sugar will be used in the scrub. Lastly, you'll be whipping these great items up with a hand blender. We're going to make the FOAMING BATH WHIP first. 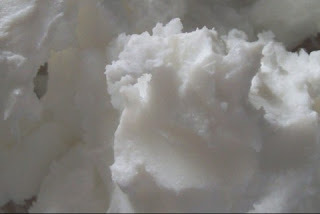 This is a rich and thick bath cream or cream soap. It is perfect for shaving your legs! 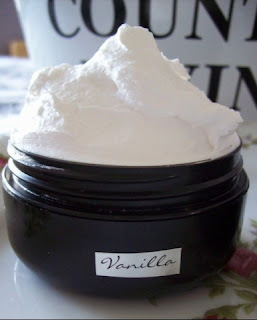 I am making a simple vanilla bath whip with Vanilla Essential Oil. Start with 8 ounces of bath whip base. Add 2 tablespoons of oil. Blend for about 5 minutes with your hand mixer. Make sure you scrape the sides of your bowl so you incorporate everything. Fold in several drops of vanilla essential oil, or scent of your choice. If you are using a synthetic fragrance oil, use 2-3%. I recommend gently folding the oil in with a spatula. If you only want to make the bath whip, place in jars and you're done! If you'd like to make a scrub, then leave half of it in the mixing bowl. My scrub will use that vanilla foaming bath whip. 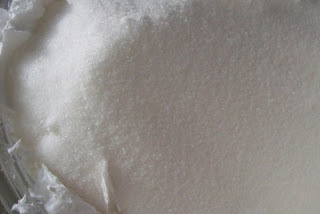 Add in 4-6 ounces of sugar to your vanilla bath whip and gently incorporate into your bath whip. It looks like a great deal of sugar, but do not worry! Add in 3 T. of cocoa powder. Cocoa powder is loaded with antioxidants and contains copper, so this delicious smelling baking staple is also beneficial to your skin! Now I am adding in about 8 drops of peppermint essential oil and 6 drops of cocoa absolute. Gently fold in again. 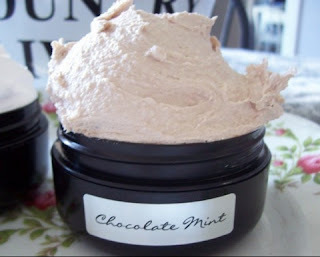 Now you have a creamy chocolate mint sugar scrub that will foam right up! When placed in the jars, it'll look like you have 2 dishes of ice cream. If you want to be fancy, you can add in mica, liquid colorants or even sprinkles. You can also pipe the bath whip like a cake icing if this is a special gift. If you have a lot of product left (dependent on jar size), just place it in an airtight container. I have a Tupperware container of bath whip in my cabinet. Note: If these are for you or someone you know will use them fairly quickly, you don't need to add a preservative. If you plan to sell these or store them for any length of time, you absolutely need to add a preservative. 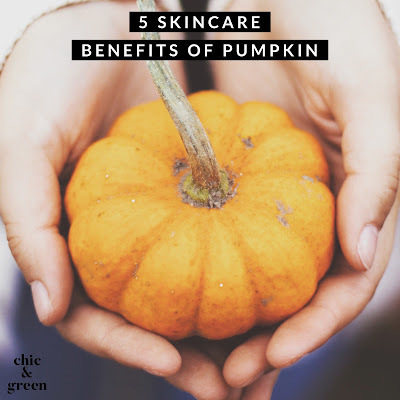 I recommend Optiphen, which is paraben free, making sure to follow the manufacter's guidelines.